Embrace the earthy tones from the golden walnut wood on this rectangular wall mirror. Mirrors come in all shapes and sizes and this contemporary rectangular wall mirror stands apart from the rest. The rounded edges add softness and the wood frame in a walnut finish brings the look together. 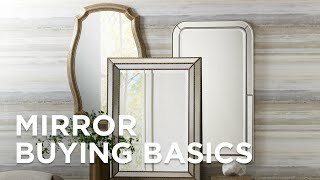 A wall mirror can be placed in any room to open up the space. 19 3/4" wide x 31 1/2" high x 2 1/2" deep. Hang weight is 11.22 lbs. Glass only section is 18" wide x 30" high. Surrounding frame is 3/4" wide. Can be hung vertically or horizontally. D-ring hangers on the back. Walnut finish. Wood frame construction. Non-beveled glass.